This monograph, completed ahead of the November 2014 deadline, examines some of the underlying factors which will be constant in dealing with a nuclear capable Iran under President Hassan Rouhani, and which will help determine the success or failure of talks in 2015. It analyzes Rouhani's eventful first year in office in order to provide pointers to what may be possible—and to some key limiting factors—for Iran under his leadership. During that time, Rouhani has been forced to balance his own progressive instincts with the instinctual caution of more conservative elements of the Iranian ruling elite. As a result, foreign hopes for his influence on Iran’s place in the world have moved from initial optimism to a more sober assessment of the options available to him. 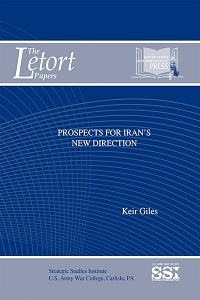 This monograph provides an essential backdrop to the forthcoming renewed negotiations with Iran by providing an introduction to the complex interplay of issues and interests which constrain the Iranian leadership.